When scanning medical charts, special care is required to successfully execute the project. The term “medical chart” is used interchangeably with medical record and health record. A medical chart can be a physical paper file, a digital copy of the physical paper file, or a database record contained in an Electronic Medical Record system. The use and maintenance of medical charts is highly regulated under HIPAA. HIPAA rules are created by the US Department of Health and Human Services, and enforcement is under the HHS Office for Civil Rights. Failure to comply with HIPAA rules can result in severe penalties and fines. Planning. The plan should include start and end dates, how to organize charts for scanning, what to scan or discard, what is medically necessary to keep, what is the retention schedule, are there exceptions to the retention schedule, how to name the electronic charts, bulk or manual loading of charts in the EMR, maintaining HIPAA compliance during the project, Business Associate Agreements (BAA) with vendors, packing charts in boxes, inventory of charts, chain of custody, urgent requests for charts, transportation, and encryption. There are many more things to consider, but these are some of the key requirements. Packing and Transportation. Charts should always be transported with care and security in mind. Proper packing is the only way to ensure that you can retrieve a chart at any time during the scanning process. Vehicles containing medical charts or electronic medical charts should never be left unattended. Electronic medical charts should always be delivered encrypted. Scanning Process. All scanning begins with Chart Preparation. Chart prep is the process of disassembling the physical chart, removing paper from prongs, placing paper in the correct sequence, organizing into categories, and removing staples and other clips. If a determination was made to eliminate parts of the chart that are not medically or legally required, they will be removed during chart prep. Scanning should be performed on professional-grade scanners with professional scanning software. 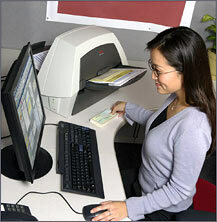 Entry-level scanners can allow scanner multi-feeding to occur, which essentially makes a page disappear. In HIPAA related scanning, a missing page could be a legal disaster for the hospital, clinic, or doctor’s office. Professional-grade scanners will last longer and perform better throughout the life of the machine. All scanners require regular cleaning for the glass over the cameras and for the drive and brake wheels. If a scanner will be sued continuously throughout the day, the scanner may require cleaning more than once per day. Paper is dirty, and used paper is really dirty. Professional scanning software should be used because of the high efficiency that can be achieved. Professional scanning software, like Kodak Capture Pro or Kofax Capture makes it possible to do “batch” processing, meaning processing of many files at once. Low end scanning software, such as Adobe Acrobat, only let you scan one document at a time, which is highly unproductive and expensive. Professional scanning software will also include special image enhancement features that will improve the quality of the scan. If the charts are going through Optical Character Recognition (to create searchable medical charts), the professional software will use the best OCR engines. It should be noted that OCR is highly unreliable on handwritten text. OCR is only valuable for typewritten text. If charts are handwritten, then OCR is not required. Verification, shredding, storage. Generally, a scanning project would be considered to be high quality when no errors can be detected. “High quality” must be defined. Scanned charts must be verified for quality. There are a variety of methods, when used together produce a very high quality result. Page counts before and after scanning are very effective. Visually inspecting every scanned page is important. A large sample should be verified in the early phases of the project. As confidence in quality rises, the sample size can be decreased. Electronic copies of the medical charts should be stored in multiple, HIPAA-compliant locations to ensure that the records will be available in the event of a major disaster in your primary storage. Once electronic medical charts are verified for quality, and they are properly stored in multiple locations, a decision must be made to either shred or store the records. In most jurisdictions, shredding is permitted so long as you have scanned copies. However, retention rules are complex and you must consult an expert about your particular situation. If shredding is permitted, this is not where you want to go for a cut-rate shredding vendor. It is highly recommended to use a NAID (National Association of Information Destruction) certified provider. In particular, we recommend vendor who will shred on their truck at your site, while under your visual control. If shredding is not an option, paper charts should be properly stored at a dedicated record storage facility. Self-storage units are notoriously prone to fire and other damage which can result in the loss of the original files. Lastly, you need to put the scanned electronic medical charts somewhere. There are 3 schools of thought. First, copy the electronic charts to the Windows file system, and use as needed. If they have been named using (Last name), (First name), they will sort easily. The second method is to upload all the charts into the EMR. This is common for medical centers and larger clinics. Third, for smaller clinics, it is more common that the chart is copied to the EMR only when a patient comes in again for treatment. This method will ensure that the EMR only has records for current and future patients. Former patients’ charts will be accessible on the Windows file system. If you would like more information about medical chart scanning, fill out the information form on the right.